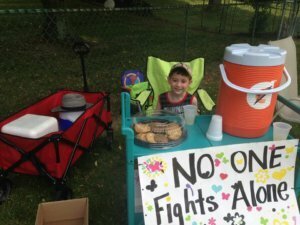 Keira’s brother Grady raised $542 by selling lemonade and cookies at Grandma’s association pool and playground to buy toys for the kids at the hospital. For each dollar raised he planned to go to the dollar store and buy toys for kids with cancer. Grady planned this for months and was finally able to open for business on July 2, 2018. Linda Kilbane (aka Grandma) helped make Grady’s vision a reality thanks to her support. Grady got to spend about 15 months with his big sister. 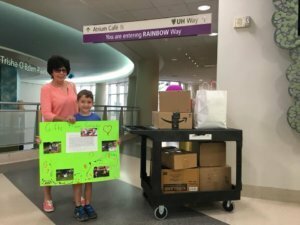 She is not physically able to be here with him, but he still has a connection with his sister and this is his way of honoring her and helping make a difference to other kids battling cancer. We couldn’t be more proud of him taking the initiative to do this. 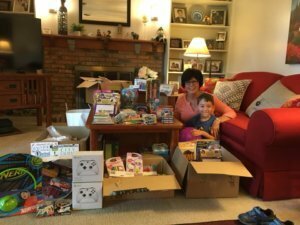 Grady delivered the toys, arts/crafts, and other fun items with the proceeds from his lemonade and cookie sales on August 20, 2018. He also had the privilege to meet two special boys that are both currently inpatient on the pediatric cancer unit. The moms of Logan and Carter were kind enough to ask us to come visit to personally deliver their gifts. That meant a lot to Grady to meet some of the kids that he did this for. Grady also helped create a poster that was on display in the playroom with a portion of the toys letting the kids know why Grady did this. My name is Grady Kilbane and I am 5 years old. My big sister Keira had leukemia and she gained her angel wings in 2014. It made me feel sad to see her sick, but I was always happy to spend time with her playing. I really liked riding in a wagon with her around the halls of Rainbow 2. I miss being able to play with my big sister, but I feel happy when I think of her and all the fun we had. I wanted to give kids at the hospital toys to make them smile and be happy the same way I felt when I was with Keira. I decided to set up a lemonade stand with my grandma to raise money and with the help of all those that donated we were able to buy a lot of toys and activities that I hope will make you smile! I really hope you all feel better and get to go home real soon. So here is a HIGH TEN to get you through your day!